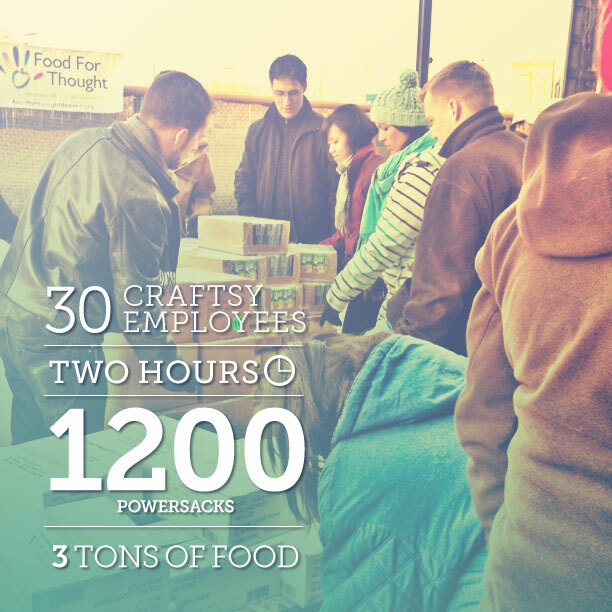 Yesterday, Craftsy employees volunteered for the second time this month with Food for Thought. This local Denver nonprofit works to provide food for underprivileged children. Every Friday they pack meals for kids (actually enough food for a family of four) for an entire weekend, and then deliver the food to two Title One schools for the students to take home. In just a couple of hours, we packed 1200 Powersacks — over 3 tons of food! We had a great time joining together to make a difference and feel lucky to have stumbled across this awesome opportunity through VolunteerMatch, which provides valuable tools for getting involved in your community.